Don’t know how your new garage door will look? 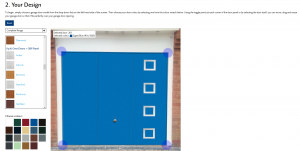 You can now visualise your new garage door with Garadors exclusive image tool, which allows you to see what different styles of garage door look like on your home. Browse through the entire range of Garador garage doors and then mock them up on a photo of your existing garage to see what they look like. You can do that here by going on Garadors website & visualise your garage door on your home. It’s a great tool if you are thinking of going for a different colour or design to what you or your neighbours have at the moment. You can choose from a large range of door styles from the popular Up & overs to a roller door, insulated sectionals & side hinged doors. With colours to also choose from, decograin options and stainless appliques – there is a design for everyone. Once designed – you can then save & submit it to us where we can provide you with a quotation based on your chosen door.